Edit Comments XT is a simple WordPress plugin that allows commenters to edit their own comments. To edit a comment, a user must have the same IP address as the user that made the comment and they must also make the edit within a specific time frame. The default edit time window is 30 minutes, but it can be changed easily in the plugin’s option page. If you’re logged in to WordPress, it will use the more feature-enhanced wp-admin comment editing screen, but if you aren’t then it will just allow you to edit the content of your comment. It’s a good idea to test the plugin from a logged-out view as well. 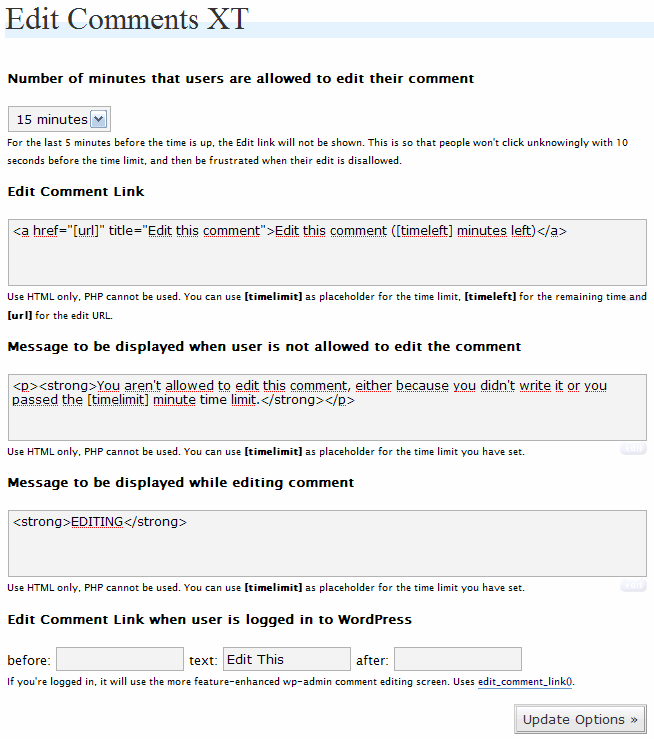 Edit Comments XT is based on Andrew Sutherland’s great Edit Comments plugin and works with WordPress 2.1.x and 2.2.x. Also, the security issues of Andrew’s plugin have been addressed & resolved. Unfortunately, the edits required to make this plugin work are fairly extensive. They don’t, however, require any core edits, which means upgrading WordPress versions will not affect this plugin. I’ll try to explain the edits the best I can. Decompress the .zip archive and upload the files into your plugins folder (located at /wp-content/plugins/) or into a sub folder of the plugins folder. Optional: Navigate to WordPress admin panel > Options > Edit Comments XT and modify the options. Here’s where it gets tricky. We’re going to need to make some changes to the comments.php file of your theme. This file is located in /wp-content/themes/**YOUR THEME NAME***/comments.php. Before we make any edits, let’s make a backup of comments.php. Copy the file and name it comments-backup.php. You should now have two comment files in your theme directory, one called comments-backup.php and one called comments.php. NOTE: For people using the default theme, Kubrick, I’ve included a modified copy of the comments.php file. It contains all the edits needed to make the plugin work. If you’re using a Kubrick-based theme, that file may also work for you. This will output the comment date and time, and then the edit link. This function replaces the WordPress’s edit_comment_link(). In your file, the first 2 are already accounted for. We need to make room for the last one. Find this: <?php if ( $user_ID ) : ?>. It means there is someone logged in. The next line might be something like <p>Logged in as.....". Here we go with a big edit. Delete this: <?php if ( $user_ID ) : ?>. You’re pretty much done! Now, we can just do a bit of beautification and cleanup. The above uses a ternary operator. Basically, if the someone is editing a comment, it will print „Edit your Comment“, and if not it will print „Leave a Reply“ . You could also use this technique for the submit button. Break out a bottle of champagne. You just finished the installation of Edit Comments XT. Enjoy! WordPress logs the IP address of all commenters, so we can compare the IP address of the comment to the IP address of the viewer. The plugin also checks the timestamp of the comment with the current time. If more than 30 minutes (default) has passed since the comment was made, then editing is off-limits. These two checks together make it secure. It uses some clever use of plugin hooks. You may notice the <form> action never has to change, it stays wp-comments-post.php. This plugin uses the ‚init‘ hook of WordPress to do its deeds before the wp-comments-post.php file fully loads and it adds a new comment. Instead, this plugin spots the existence of a hidden input element, makes the appropriate edits, and then runs away before the file is fully loaded. Why is there a time limit on editing? This plugin is useful when a user hits „Submit Comment“ and then realizes he or she made a glaring spelling error, or forgot an important part of what they were going to say. Also, by having a time limit, users aren’t allowed to go back and change something they said days ago that they now regret. When there’s a discussion, its best if people can’t go back on their words, or else it can get really confusing. Lastly, it’s good for security. In the extremely unlikely case that someone else gets the same IP address as one of your commenters and then goes and visits your blog, they won’t be able to edit the comment because of the time-limit.